If you have been reading my blog for awhile then you may remember when I mentioned my bucket list for 2013. I plan on redesigning all three bedrooms on the second floor. 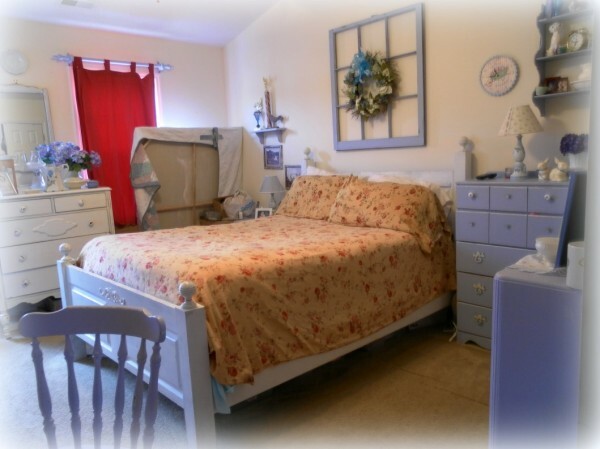 Each room needs a complete overhaul with new flooring, new paint and a whole new look. Today I want to share with you my design plan for the master bedroom. Let’s take a look at some “before” pictures shall we? This is what you see when you walk into the room. I built the bed frame about 10 years ago or so from recycled closet doors and some 4 X 4’s. I am a little tired of it. It needs a pick me up and I have a plan in mind. Here is a better view from the doorway. You may notice the wrinkles in the carpeting. It drives me crazy! 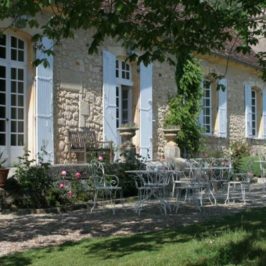 It is also dingy from eight years of dogs, kids and normal wear and tear. It stays that way no matter how often I steam clean it. It will be the first thing to go in the room. You may also notice the pile of “stuff” in the corner by the window. That is my collection of goodies that will be going in to the room during the makeover. I really love the blue with purple undertones on some of the furniture and decorative window frame but I don’t think it will work with the new color scheme. Don’t you just love the red drapes on the windows???? Groovy, right? They were a quick fix pulled out of the linen closet after my pooch shredded my gingham blue set. I really did not want to give the neighbors a show when I came out of the shower in my robe so decided the red would have to stay for awhile. 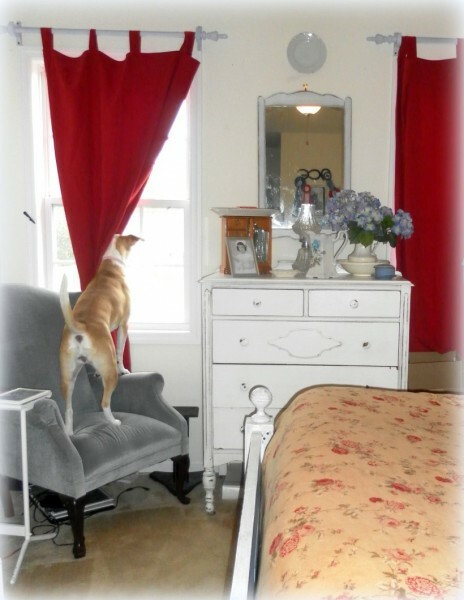 You can see Miss Jingles on the chair doing one of her all time favorite things, looking out the window, barking at anything she sees. This is the view when standing in front of the window and looking to the other side of the room. You may see a hint of the future design motif. Can you guess what it is? And last but not least, the view from the bed shows the very pretty electronic ensemble and my “home office”. The wall cabinet has now been emptied and will be taken down within the next day or so. I would love to move the desk and filing cabinet out as well but I don’t have any place else to put it at the moment. So, that’s what my master bedroom looks like right now. 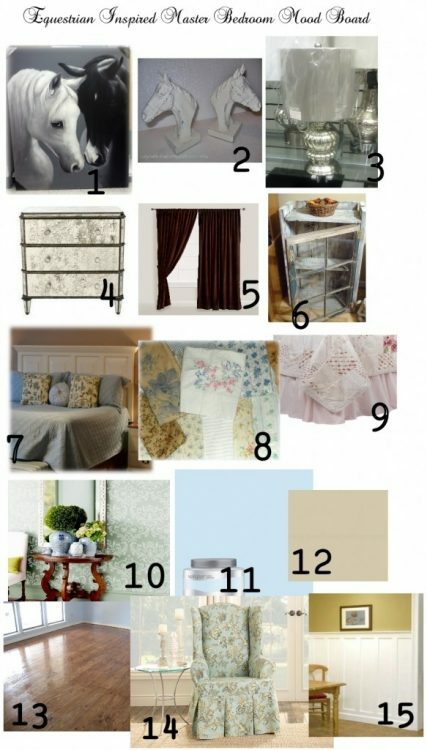 Here’s my inspiration board for my master bedroom…..
Soothing blues, whites and creams with a punch of red here and there with a shabby chic, equestrian theme! 1. Horse Giclee – When I saw this gorgeous horse giclee in Ross’ a few months ago I stopped dead in my tracks. I loved it. It was sooo huge though and didn’t have any place to put it so I walked away. 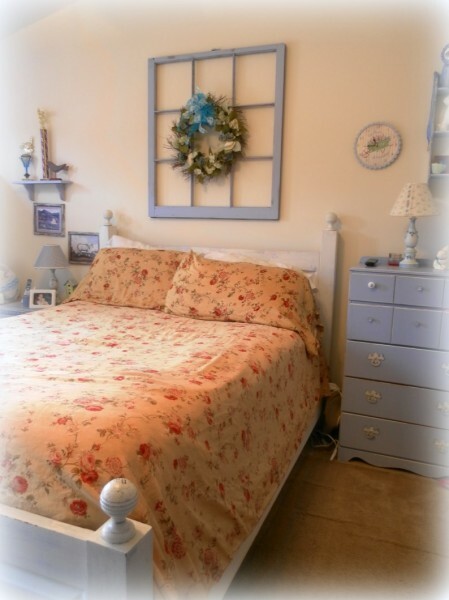 Once the wheels were turning for my master bedroom makeover, I kept thinking about it. I went back a few weeks ago and was lucky to find that it was still there. I brought it home and it will be going above the bed. 2. Horsey Book Ends – I found these horse head bookends online. They will look great on the dresser by the windows. 3. Mercury Glass Lamps – I found two of these mercury glass lamps at TJ Maxx. I thought they would be great as bedside lamps. I didn’t purchase them at the time and was surprised when I got them as a Christmas gift! 4. Anthropologie Inspired Mirrored Glass Night Stands – About two years ago I saw this beautiful antiqued mirrored dresser at Anthropologie in Las Vegas. I loved it but at $1298 it was not in my budget. 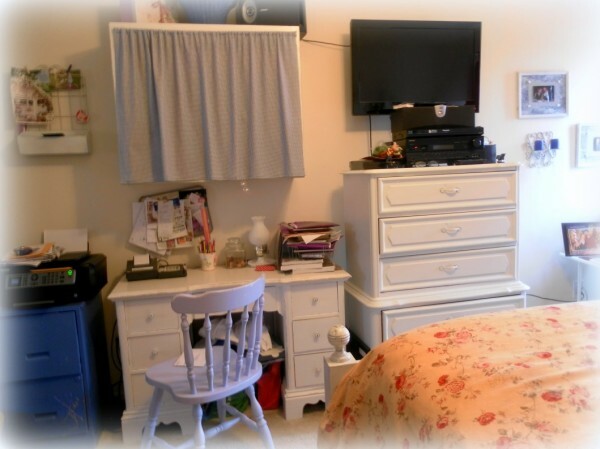 With it as an inspiration, I will be creating my own night stands by revamping a couple of second hand dressers. 5. Scrumptious Chocolate Brown Velvet Draperies – Need I say more? 6. 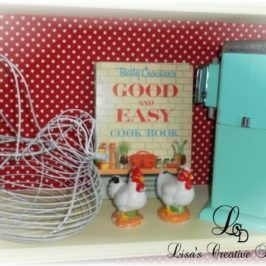 Upcycled Window Cabinet – I have created a few of these in the past and have a small window sitting in my garage that is the perfect size. 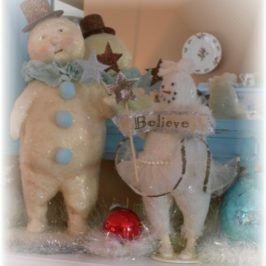 I will be using it to display special keepsakes I have gotten over the years. 7. 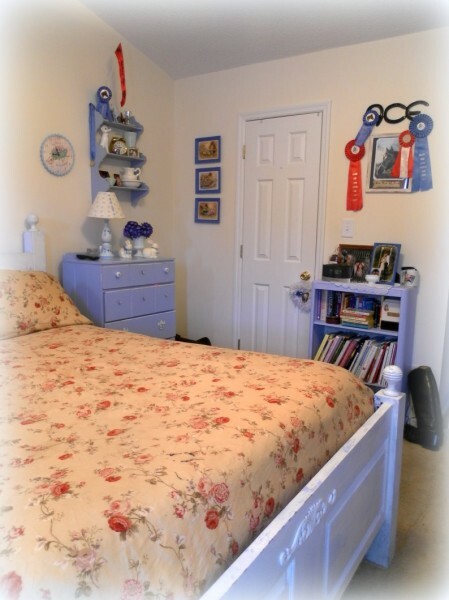 Upcycled Door Bed – I will be redesigning the bed frame. 8. Shabby Chic Floral Fabrics – I aim to do the bedding in these sweet floral fabrics. 9. Shabby Chic Quilt – This is my inspiration for the bedding. The plan is to create a quilted coverlet out of those pretty floral fabrics. 10. Damask Wall Stencil – I love how this paint treatment looks like wallpaper. I want to do this on the upper half of the walls. 11. & 12. Color Pallet – A soothing light blue with a light beige damask design overlay. 13. NEW FLOORING! – I have been looking for an inexpensive flooring option for the upstairs. Can you believe this is plywood? 15. DIY Wainscot – I would like to do a simple wainscot on the lower half of the walls and think board and batten would look great. 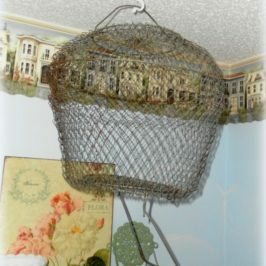 There are a lot of DIY enthusiasts tackling this project and it seems simple enough. I have a few other tricks up my sleeve for this room and I can’t wait to get started! It is going to be a lot of work but I am so excited to see it all finished. I will keep you up to date on the transformation! 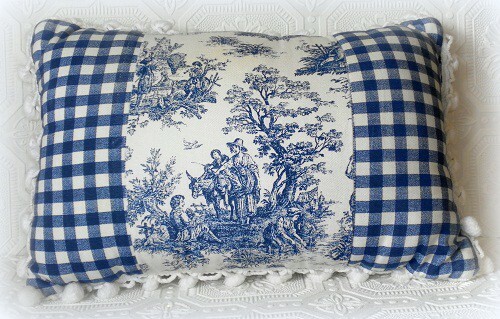 What says Country French more than a Blue and White Toile Accent Pillow? Beautiful navy blue gingham and country toile trimmed in ball fringe. Too Cute! 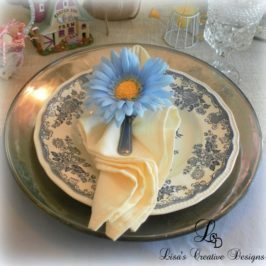 Now on sale at LisasCreativeDesigns.com. 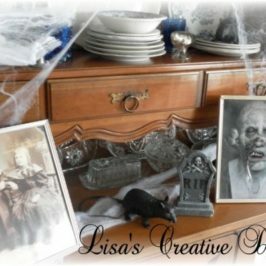 Wow, Lisa…It is going to be beautiful!! I grew up on a horse farm, so I love the horse element…reminds me of being a kid. So glad you found me through the Country Chic Cottage, so that I could find you. 🙂 I can’t wait to look around some more here on your blog.